Some links may be inoperable due to changes subsequently made to corresponding pages. Added image of a 1984 base transport plate to our Motor Vehicle Business and Type Sets pages, courtesy of Eric Bos; added image of 1978 base handicapped person plate to our Non-Passenger Plates and Type Sets pages; added text to handicapped person section regarding when the type was likely created; changed copyright notice on all pages to reflect the new year; altered certain navigation bar graphics based upon recent changes to the site. Segregated this activity log from the page upon which 2008 activity will be listed; inventoried our 54 current pages and prepared to modify links and copyright dates on Jan. 1, 2008. One year ago DCplates.net was comprised of 38 pages. Continued to work on Capital Traffic section. Continued to work on Capital Traffic section, the posting of which is expected by the end of this month. Made minor edits and changes to Capital Traffic section. Continued to work on Capital Traffic section discussed in Oct. 8 and Nov. 6 entries. Continued to work on Capital Traffic section discussed in Oct. 8 entry. This series of photographic galleries is expected to be comprised of at least 30-40 images of D.C. traffic scenes covering a period of 100 years when it is made available for viewing later in November. Continued to work on Capital Traffic section discussed in Oct. 8 entry; modified white-on-red navigation bar button linking to 1966-present plates page to read "1966-2007 Passenger;" split Site Activity Log into two pages (2006 and 2007). Continued to work on Capital Traffic section discussed in Oct. 8 entry. Continued to work on Capital Traffic section; also made three spelling and content edits based upon comments received from readers. Continued to work on Capital Traffic section discussed in entries of earlier this week. Worked on page discussed in Oct. 8 entry and separate page from which it will be reached. Worked on page discussed in Oct. 8 entry. Began creating a new page upon which will be shown images from the collection of Charlie Gauthier of early D.C. motoring scenes. This will take quite some time to prepare but will be worth the wait! Added image of 1970 reserved registration number renewal instruction letter, courtesy of Skip Lackie; added image of 1968 (undated, exp. 3-31-69) reserved-number plate renewed for the 1969 (exp. 3-31-70) registration year; added images of 1974 and 1984 base Medical Doctor plates photographed in use by J. Reid Williamson to the section of our Non-Passenger Plates page dedicated to that type. Added images of five documents that comprise a complete 1969 (exp. 3-31-70) registration renewal application mailing to our new page dedicated to large-format ephemeral items, courtesy of Skip Lackie. Added image of a 2005 (exp. 2006) "renewal sheet," a DMV-prepared document that includes a motor vehicle registration card and corresponding windshield sticker, to a dedicated page for large-format images of ephemeral items. Thanks to Skip Lackie for providing this interesting document. Added four images in our DCscenes series to the City Bicentennial Plate section of our Optional Plates page. Each of the shots shows one of the rare Bicentennial plates in use, including two seldom seen non-passenger varieties. Persistent photographer J. Reid Williamson found them on plate spotting excursions for DCplates.com in May and June; also modified text in this section to reflect that plates of this design are presumably no longer available. Added image of 1967 Shrine Imperial Council plate provided by Charlie Gauthier to our page dedicated to Shrine plates; added image of 2005 (exp. Oct. 2006) registration card to our 2000 Baseplate page, courtesy of Andrew Pang. Modified explanatory text about Special Annual Hauling Permits on our page dedicated to that permit type based upon information contributed by Skip Lackie. Additional improvements to text on this page are planned for the near future. Added images of optional auto plates with "www.washingtondc.gov" in place of the standard Taxation Without Representation slogan: Plates BJ-7392 and BJ-7393, photographed by Mike Hart, are shown on our Optional Plates page and described on the DCscenes page; close-up images of the URL on BB- and BJ-series plates have also been added to the Optional Plates page; and an image of plate BB-1845 has been added to our 2000 Baseplate page. Completed and posted to Ephemera page items begun on Aug.2. Began creating table of links for Ephemera page to take readers to images of various paper items located elsewhere on the site; prepared 1990s registration renewal application envelope for presentation on the same page. An image of a recent registration renewal form has been added to our 2000 Baseplate page, courtesy of Skip Lackie. Posted additional D.C. DMV documents provided by Skip Lackie: registration renewal certificate and plate sticker envelopes have been added to our 1966 and 1978 baseplate pages, and a windshield sticker that served to permit drivers to operate a newly-registered vehicle for up to 10 days without an inspection sticker is now shown on the Ephemera page. Posted registration renewal certificate and plate sticker envelopes contributed by Skip Lackie to our 1974 baseplate and 1984 Baseplate pages. Posted D.C. DMV documents provided by Skip Lackie to two pages: A 1969 registration fee change notice and a 1972 registration renewal notice have been added to our 1968 baseplate page, and a 1985 registration certificate form now appears on our 1984 Baseplate page. Modified text in which the 1984 implementation of the District's staggered registration system is described based upon information taken from a DMV Q&A brochure on the subject provided by Skip Lackie; added image of the aforementioned brochure that is accessible by clicking on the sticker placement graphic shown near the bottom of our 1978 Baseplate page; added image of windshield sticker and corresponding application instructions to our 2000 Baseplate page, also courtesy of Skip Lackie. Added image of a 1968 National Cherry Blossom Festival registration certificate to our page devoted to that Special Event plate type, courtesy of Skip Lackie; added images of plate validation sticker placement instruction slips to our 1968 Baseplate plage, also provided by Skip. Added image of a new four-digit Historic Motor Vehicle plate to our page dedicated to Antique Car and Historic Motor Vehicle plates; Added Metro Police section to our Government-Owned Types page including a photo provided by Erik Bos; Added Solid Waste section to our Truck and Trailer types page; corrected maximum number of characters allowed on personalized plates (seven) on our page dedicated to that type; Replaced existing image of current (graphic) Police Dept. plate on our Government-Owned Types page with a more clear image provided by Erik Bos; Added image of 1974 (Bicentennial) base Diplomatic Staff plate provided by Erik Bos to our Non-Passenger Plates page; added same plate to our Type Sets page, an updated version of which has not been posted due to continuing revisions mentioned in the entry for March 13. Completed editing of Skip Lackie's history of the development of the HMV registration and plate type and posted same to our page dedicated to Antique Car and Historic Motor Vehicle plates; also posted to this page two images in our DCscenes series taken by J. Reid Williamson of HMV plates in use. Same task as June 21. Same task as previous day. Continued to edit text prepared by Skip Lackie in which the history of the development of the Historic Motor Vehicle classification is described. Because this work is incomplete it has not yet been posted on the site. Added image of a rare National Association of Black Scuba Divers organizational plate photographed by J. Reid Williamson to the Organizational Plate Program section of our Optional Plates page. Reorganized layout of and updated text in the Organizational Plate Program section of our Optional Plates page, and added an image to our DCscenes series of an organizational plate in use. Images added, of Firefighters Local 36 (flat style) and FOP plates, were provided by J. Reid Williamson. Began editing text about the history of Historic Motor Vheilce (HMV) plates prepared by Skip Lackie, who was instrumental in the type being created during the 1970s, for future inclusion on our new page dedicated to the type; launched first version of our Antique Car and Historic Motor Vehicle plates page, which is far from complete, made necessary adjustments to links elsewhere on the site; and removed Antique Car and HMV information from our Non-Passenger plates page. Made edits to the Antique Car section of our upcoming new page dedicated to this type, which is not yet online, based upon information contributed by Skip Lackie. Added personalized motorcycle plate section to our Non-Passenger plates page comprised of a photo provided by Joe Sallmen; Added images of 1946 (exp. 3-31-47) and current (exp.10-31-08) cycle plates, also provided by Joe, to the Motorcycle plate section of the same page; added image of a 2008 plate sticker taken from a motorcycle plate image contributed by Joe to our sticker gallery; created and began editing a new page dedicated to the subject of D.C. Antique Car and Historic Motor Vehicle plates (which is not yet online). Added two images taken by J. Reid Williamson to our DCscenes series: a recently-issued CS-series auto plate now appears on our 2000 Baseplate page, and a taxi travelling on Pennsylvania Ave. is shown in the Hire (Taxi) section of our Public Service Types page. Modified section headers for 1969 and later Presidential Inaugural plates on our page dedicated to that subject to the new red, white, and blue format; added image of a 1961 Inaugural plate mailing envelope to the same page, courtesy of Charlie Gauthier. Added images of Presidential Inaugural plates provided by Robert Hart to our page dedicated to that subject: 1961 souvenir plate upon which is listed names of individuals that produced them and 1965 sample plate; also introduced new red, white, and blue Inaugural plate section headers for 1933 through 1965. Added to our Presidential Inaugural plate page an image of a 1961 sample plate from the collection of Robert Hart. Added images of sample 1941 and 1949 Presidential Inaugural license plates to our page dedicated to these special event plates, courtesy of Robert Hart. Added to the 1957 section of our Presidential Inaugural page an image of a plate mailing envelope that is linked to a composite image comprised of enlarged views of both sides of the envelope and the corresponding registration card. This rare ephemera is from the collection of Charlie Gauthier. Added images of a 1937 plate mailing envelope and 1953 and 1957 registration cards to our page dedicated to Presidential Inaugural special event plates, courtesy of Charlie Gauthier; also added an enlarged image of a 1937 inaugural plate and made slight modifications to text due to the addition of these images. Added images of 1937, 1941, and 1949 Presidential Inaugural registration cards, courtesy of Charlie Gauthier, to our page dedicated to that series of special event plates; made slight modifications to text adjacent to these new images. Added an image of a public school with D.C.-plated cars parked outside to our 2000 Baseplate page as part of our DCscenes series of images. Added two more images in our DCscenes series: a BJ-series auto plate, with the city Web site URL printed in place of the TAXATION slogan, now appears on our 2000 Baseplate page, and an old Pontiac with a new Personalized plate has, thanks to J. Reid Williamson, been added to our page dedicated to plates of that type. Images of a current auto plate and close-up images of the corresponding registration and inspection stickers have been added to the Registration section of our Miscellaneous Topics page. Added four images to our DCscenes series, courtesy of J. Reid Williamson: two images of the same car with reserved-number plates of different (consecutive) annual plates are shown on our Reserved-Number Plates page; the fith plate issued with the AB-1234 general-issue numbering format is shown on our page dedicated to the 1991 Baseplate; and a typical Capitol Hill street scene appears on our 2000 Baseplate page. Added image of a second personalized plate to our Current D.C. Plates page; added image of a new (2007-08) reserved-number plate photographed by J. Reid Williamson to our Reserved Passenger Plates and Current D.C. Plates pages; added two images of a 1991 base Commercial plate in use and photographed by J. Reid Williamson, one in the context of a DCscenes image, to our page dedicated to that type. Added images in our DCscenes series: motorcycles parked on M St. NW and photographed by Andrew Pang are shown in the Motorcycle section of our Non-Passenger Plates page, and an image of a current passenger plate on a vehicle with blooming cherry trees in the background taken by J. Reid Williamson has been added to the top of our Home page. The picture of a bus plate previously in this position has been moved to the Bus plate section of our Public Service types page. Modified home page banner to include an image of a D.C. highway route marker photographed on the Anacostia Freeway by J. Reid Williamson. Added images of 1961 (exp. 3-31-62), 1964, and 1968 Livery plates to our Public Service types page; also modified Hire and Livery section sub-heads and text to reflect discovery of earlier examples than heretofore known. Added three images of two key tags provided by Charlie Gauthier to our Ephemera page; also added a second image of a 1972 Ford Mustang to our Cherry Blossom Festival plate page courtesy of Rex Turner, the vehicle's owner, and Charlie Gauthier. Added images of 1972 (exp. 3-31-73), 1973, and 1974 reserved-number passenger car plates to our page dedicated to that subject. Added images of 1969 (exp. 3-31-70), 1970, and 1971 reserved-number passenger car plates to our page dedicated to that subject. Added images of 2006-07 dealer plate contributed by Andy Pang to our Dealer and Current D.C. Plates pages; added image of 2006-07 Manufacturer plate to our Motor Vehicle Business Types and Current D.C. Plates pages; added image of a second Water and Sewer Authority plate and a close-up of that plate's graphic to the section of our Government-Owned Types page dedicated to this type, courtesy of Andrew Pang; added images of a motorcycle and second general-issue passenger plate to our Current D.C. Plates page; removed image of a police motorcycle registered with a private passenger cycle plate from the Police Motorcycle section of our Government-Owned Types page and added it, with the vehicle's police markings not shown, to the Motorcycle section of our Non-Passenger plates page. Added image of a Water and Sewer Authority plate to our Government-Owned Types page, courtesy of Andrew Pang; also added another image in our DCscenes series to our 2000 Baseplate page of vehicles stopped at a traffic light in southwest D.C. Photo provided by J. Reid Williamson. Added an image (in our DCscenes series) to our Government-Owned Types page of a D.C. Government Parking Enforcement vehicle; also researched and corrected the vehicle identification in our caption of a 1948 Oldsmobile on our DCscenes page. Added an image (in our DCscenes series) to our Truck and Trailer types page of a beer delivery trailer registered in D.C. Photo provided by Andrew Pang. Added an image (in our DCscenes series) to our home page of a D.C.-registered vehicle with the Washington Monument in the background. Photograph by J. Reid Williamson. Added images: 1964 (exp. 3-31-65) general-issue passenger plate with second numbering configuration (1A23) to our Pre-1966 Passenger page, 1965 Rental Car to our Public Service types page, and 1970 Commercial plate to our page dedicated to that type. Also made minor variations to our new secondary navigation bar and began adding that feature to various pages. Added images of six AAA badges, courtesy of Charlie Gauthier, to our new page upon which D.C. plate-related ephemera will be shown and discussed. Modified secondary (red-on-white) portion of navigation bar by adding a second line with links to three new pages being developed: Ephemera, Current D.C. Plates, and Collecting D.C. Plates. Each of these pages has been set up, and content has begun to be added to the page dedicated to D.C.'s current "Taxation" plates (to supplement our more detailed discussion of them already posted here). Added images of current general-issue passenger, reserved-number passenger, disabled motorist, personalized, bus, and livery plates in use to our new page dedicated to this type of content. Images of the bus and livery plates were provided by J. Reid Williamson. DCplates.com readers that would like a sneak preview of the new pages may reach them through the new links (discussed above), which have been added only to this page. Launched our revised home page with the first three of what we hope will be many images from a series entitled DCscenes and showing D.C. license plates in use. Thanks to J. Reid Williamson and Andrew Pang for the first shots. Added images of 1960 (exp. 3-31-61), 1961, and 1962 Trailer plates to our Truck and Trailer types page. Also worked on revised home page discussed in March 16 entry. Added image of Order of the Eastern Star organizational plate photographed by Andrew Pang to our Optional Plates page. Began modifying home page in order to accommodate examples of a new series of photographs for DCplates.com, entitled DCscenes, which will be used to show D.C. plates in the context of their being used. Worked on first image and created a new page, to be accessible by clicking on DCscene images, that will be comprised of their captions and photo credits. Created and began working on a separate page that will feature D.C. plate ephemera such as mailing envelopes, registration certificates, DAV key tags, AAA badges, plate toppers, emissions test stickers, and similar items. Added image of 1994 Bus plate with the slogan and city name in the reverse position of those characteristics on the plate of this type and base that was already on our Public Service types page; replaced images of Delta Sigma Theta plate no. 45 on our page dedicated to optional plates with better images of plate no. 64; added images of the current base Handicapped Person plate and a close-up of the graphic on one of our Antique Car plates to appropriate sections of our Non-Passenger Plates page. Added images: 1961 (exp. 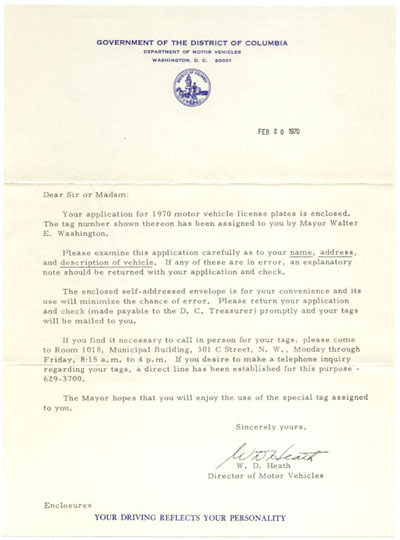 3-31-62) Transport plate to our Motor Vehicle Business Types page, 1962 (exp. 3-31-63) Dealer plate to page dedicated to that type, and 1974 base D.C. Government plate to Government-Owned Types page. Made minor alterations to text on Dealer plate page. Began work (offline) to add 1974 base types to our Type Set page. Added images of current base Trailer plate, validated through Nov. 2008; 1984 base Medical Doctor plate; and expires 2007 Temporary plate taken in use by Andrew Pang; also added image of 1969 (exp. 3-31-70) Medical Doctor plate. Separated Antique Car and Historic Motor Vehicle section of our Non-Passenger plates page into two separate sections and added/modified corresponding text; also added available images of plates of both types. Added images of 1963 (exp. 3-31-64) and 1965 (exp. 3-31-66) motorcycle plates to our Non-Passenger plates page; also reconfigured lower portion of home page so as to more easily add names of contributors. Added image of 2005 Presidential Inaugural sample motorcycle plate, courtesy of Bob Hart, to our page dedicated to Inaugural plates; added images of Police and Fire plates to our Government-Owned Types page and a 1952 Commerical plate to our page dedicated to that type. Added image of 1970s Antique Car plate to our Non-Passenger plates page. Modified and expanded text on our Reserved Passenger Plates page that addresses the design and replacement timing of 1960s and later reserved plates. Made a number of changes to improve our page dedicated to explaining D.C. plates used during what is arguably their most confusing era, the nine-year period from April 1965 through March 1974. More changes are planned in order to improve the accuracy and efficiency of this page. Added image of 1989 Presidential Inaugural Secret Service plate, courtesy of Bob Hart, to our page dedicated to Inaugural plates. Completed and launched new home page. Our old home page is still online but will not continue to be updated for changes such as new contributors. If you want to see the old page, click here. Continued to work on new home page. Began designing an entirely new home page for DCplates.com. Added image of 1936 U.S. Government plate to our Government-Owned Types page. Completed and launched first draft of page dedicated to the subject of Personalized plates; made necessary adjustments to Non-Passenger plate page in order for the new page to be accessible. Additional work on text about the history of personalized ("vanity") plates on a page that's not yet online. Worked on the text of our page, currently under construction and not yet online, about the history of personalized ("vanity") plates. Added image of one more 1964 base Personalized plate to our page dedicated to that type (which is not yet online); slightly reorganized page and began adding non-caption text. Replaced image of 1956 (exp. 3-31-57) Diplomatic plate on our page dedicated to that type, courtesy of Kevin and Chalie Gauthier, with a plate in better condition than what had been posted on Dec. 1; added images of two additional 1964-base personalized plates to our page dedicated to that type (which isn't quite ready to be posted), also began writing text for that page in the form of captions for most of the photos prepared thus far. Prepared images of four first-issue personalized plates and posted them to our new page dedicated to that type (which is not yet online). Began preparation of a separate page dedicated to personalized plates; posted image of first-issue plate (with no sticker) to the new page. Added images of 1977 (exp. 3-31-78), 1982 (exp. 3-31-83), and expires June 1989 motorcycle plates to our Non-Passenger plate page. Thanks to Charlie Gauthier for images of the 1977 and 1989 plates. Added image of 1956 (exp. 3-31-57) Dealer plate to the page dedicated to that type; added images of 1932 and 1937 motorcycle plates to our Non-Passenger plate page. Updated the table near the top of the 2000 baseplate page with the approximate cutoff point of general-issue passenger registration numbers issued at the end of 2006/beginning of 2007. Updated copyright notice on all pages.